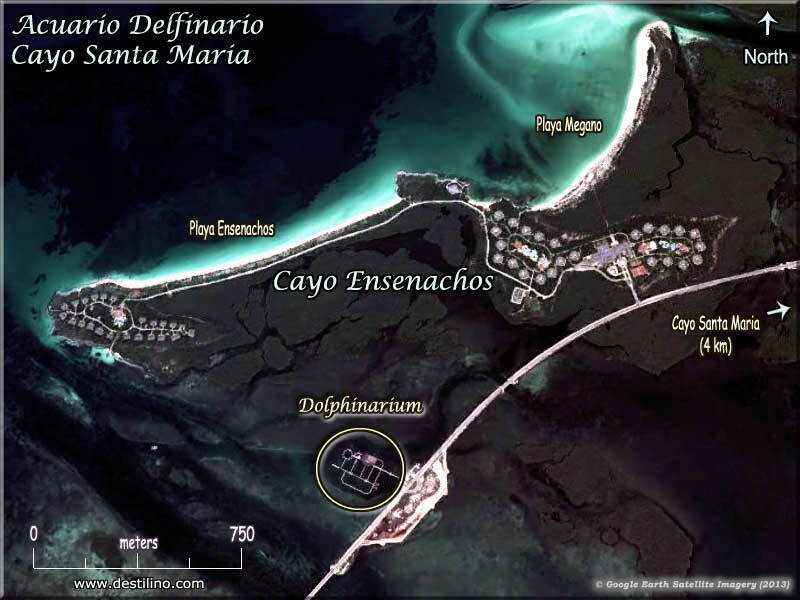 This large and modern dolphinarium is located near Cayo Ensenachos which is one of the three sister islands of the "Cayos of Villa Clara" (with Cayo Santa Maria and Cayo Las Brujas). It opened its door in August 2011 and it's managed by the Cuban Group Gaviota. This Delfinario is quite impressive in size and services! Cubans have put a lot of effort in this project, and they say it's the largest of its kind in all Latin America. The size of the enclosed pools are much larger (2,400 m2 on average) than many other dolphinariums in Cuba and elsewhere. The Delfinario includes: Six interaction pools (for up to 21 dolphins), an entertainment area of 900 m2 and 260 seats for dolphin shows (2 shows daily, at 10:30 am and 06:00 pm), and another area for sea lions shows. Click to view a map of the Acuario-Delfinario. Click to watch our two YouTube videos of the Delfinario, one taken in December 2011 and one taken inMay 2015. • On site: Pay 69 CUC to swim with dolphins for about 30 minutes. • Book the Catamaran 1-day Cruise which includes a 15 minutes interaction (*) with dolphins. (*) Note that the dolphins interaction included with the Catamaran Tour is done with participants standing on a submerged platform in about 3 feet (1 meter) of water; you don't actually swim with dolphins. If you wish to get into the pool to swim and play with them, then you have to pay the extra 69 CUC for the 30-minutes Smiw with Dolphins option mentionned above. During the interaction a professional photographer will take many pictures (or videos) of you with your new marine friends. You may buy these photos/video (on a DVD) from the on-site Photo-Shop, if you wish. WARNING! We recommend that you verify the content of the DVD before leaving the dolphinarium. • Don't wear jewerly as it may hurt the dolphins' skin. • Do not have suntan lotion recently applied as it may affect the dolphins' sight. Other services can be found on-site such as: a bar called “El Vapor” (10 tables, soft drinks and beer for 1.50 CUC and cocktails for 2.50 CUC), a restaurant called “El Bergantin” (160 seats), a photo shop, and bathrooms. You can go to the doplhinarium by taxi (3 to 15 CUC one-way, depending on hotel) or with the Panoramic Bus (2 CUC per ride) which stops at every hotel, the pueblos, and the Delfinario. If you opted for an organized tours, then transportation in an air-conditionned from/to your hotel is included. In Cuba there are several other dolphinariums, they are located in the following tourist centers: Varadero, Holguin, Cayo Guillermo/Coco, Cienfuegos, Cayo Largo, Baconao and Havana. The biggest dolphinariums are the one in: Cayo Santa Maria, Varadero and Holguin.